By Scott Gilfoid: Trainer Freddie Roach rates Anthony Joshua as the best heavyweight in the world right now, and he says he would knockout WBC champion Deontay ‘Bronze Bomber’ Wilder if that fight ever happens. Roach saw Wilder’s win over Cuban Luis Ortiz on March 3, and he saw how the referee came close to stopping the fight in the 7th round after Wilder was hurt by a big shot. Roach said Wilder is a “sloppy” fighter, but still effective due to his huge punching power. Wilder and Joshua could be facing each other later this year. Joshua (20-0, 20 KOs) wants the fight, but he’s got to get past Joseph Parker on March 31st. Parker is no piece of cake. He’s perhaps more dangerous than Wladimir Klitschko was for Joshua, because he can punch, move and he’s got the killer instinct to finish off his opponents. Joshua wouldn’t be able to count on Parker letting him survive if he gets him hurt the way Wladimir did. Parker isn’t the type to let his hurt opponents survive once he has them hurt. “The Cuban got a little bit tired like I thought he might,” Roach said to Fighthub about Luis Ortiz. “The thing is he came on really good there. The referee came really close to stopping the fight. Wilder came back. He’s a little bit sloppy with the right hand. He was sloppy. The thing is he was very effective though,” Roach said. 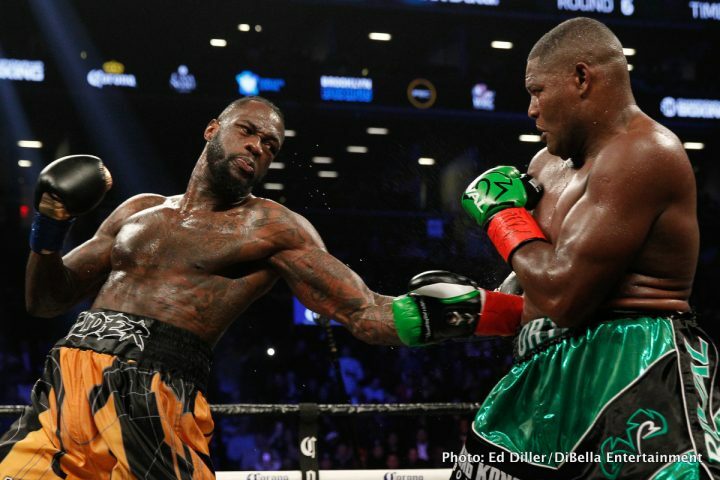 Wilder, 32, wasn’t throwing power shots during substantial portions of the fight, and that gave Ortiz an opportunity to control much of the contest. Wilder gave Ortiz the first four rounds of the fight by fighting timidly. In the 5th, Wilder threw a hard-right hand that dropped the Cuban late in the round. Wilder still didn’t take advantage of the situation in the 6th by going after Ortiz. One round later in the 7th, Ortiz hurt Wilder with a left-hand counter shot. Ortiz then poured it on with a flurry of shots that had Wilder very close to being knocked out. In looking back at the Wilder-Ortiz fight, it could have been an easier one for the 32-year-old Wilder if he’d attacked Ortiz from the outset instead of waiting so long. When Wilder did start fighting with confidence in round 10, he knocked Ortiz down twice and got the stoppage. The way Wilder fought the 10th round was exactly how he fought against Bermane Stiverne in his 1st round knockout on November 4 last year. Wilder fought with confidence and he made easy work of Stiverne. If Wilder fights like that against Joshua, he could knock him out him, because he’s already been shown to have questionable punch resistance in more than one fight. If Roach was Joshua’s trainer, he might have a tough time getting him off weights. I don’t think Joshua would follow Roach’s instructions. He seems to believe that he needs the muscles to win fights. It’s unclear who told Joshua that he needs to be bulky for him to win at the heavyweight level, but someone had to have told him this, because he clearly has been hitting the weights hard in building his frame from 225 to 254 lbs. since turning pro. You don’t pack on 30 lbs. of pure muscle in just 5 years without hitting the weights hard. Usually when someone puts that much muscle on in such a brief period as Joshua has, they tend to add a lot of fat. Joshua doesn’t have fat. He’s packed on pure muscle, and it’s slowed him down dramatically from the fighter he was back in his amateur days. Roach would likely be wasting his time trying to get Joshua to stop lifting weights. If Joshua was struggling and losing fights, then I think he would listen to what Roach tells him about cutting out weights and leaning down. Joshua is winning despite his bulky frame, and he’s not going to listen to Roach or anyone at this point. It’s going to take some additional fights where Joshua gasses out because of his muscles for him to get a clue and realize that weight lifting is hurting his performances rather than helping them. ”He wrote me a letter saying, ‘how good could I be with Freddie Roach in my corner?’” Roach said of Joshua. ”I would love to have him, because the first thing I would do is take him off the weights, because I believe speed and power is more important. I think he’s a little bit too bulky, and it does cause fatigue levels to come faster,” Roach said. Roach would like to have Joshua as one of his fighters, but that’s unlikely. Joshua has a trainer already, and he’ll probably stick with him until he starts losing. Roach could probably help Joshua improve if he were willing to listen to him and follow his instructions. Joshua has had so much success that I think he’s beyond listening to someone. He’s on cruise control now, doing his own thing and hoping it works in terms of his training. ”I saw him get knocked down in the Klitschko fight. He had a lot of heart to get back up and take over,” Roach said of Joshua. Any fighter will get up after they get knocked down. Joshua did what anyone would do after being knocked down. But the reason Joshua was able to come back and win the fight wasn’t because of what he did it. It was more of a case of Wladimir making a calculated mistake by boxing Joshua and trying to win a decision. You don’t see that too often from fighters when they have their opponents hurt. Wladimir didn’t want to try and finish Joshua off after he had him hurt. There was no greatness from Joshua that he was able to come back and win the fight. Joshua wouldn’t have won the fight if Wladimir had stepped on the gas in rounds 6 through 9.